UDM Downloads > Vevo! CatalogBuilder! CatalogBuilder is multimedia CD brochure making software for both business as well personal album. A Business Enterprise can build category driven product catalog with highly customizable styles and powerful features, without any technical skills. 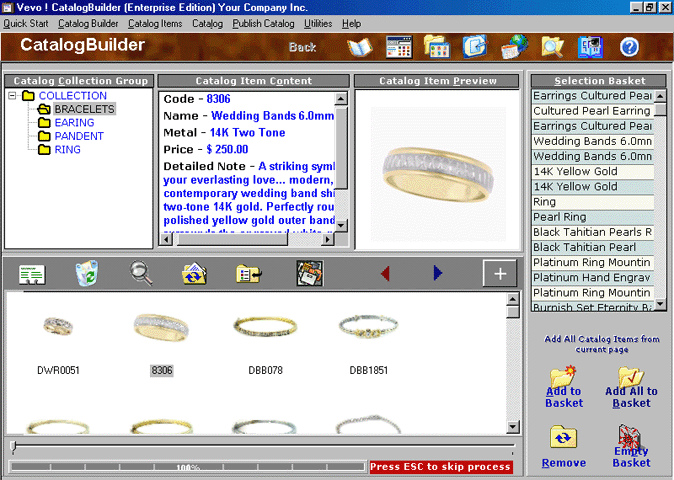 Catalog contain power search, categorized navigation, thumbnail viewing, selection basket, products description pages, powerful slide show, product detail section, special view graphics, magnified view, graphic zooming option and many more features, to provide rich and expressive experience to your catalog viewer. Once published, catalog can be easily distributed / displayed as web gallery, web catalog, photo album, multimedia CD brochure or electronic catalog. Unlike most photo album software or photo gallery creators, CatalogBuilder gives typical edge for business with make you create entire catalog with most issues, you as a business enterprise may like to address. For personal purpose photo albums as well, Catalog Builder perfectly works as photo album maker. User can customize and configure catalog contents, theme and design setting to suit its industry and campaign. User need not to depend upon external web designers & catalog service providers for frequent catalog updates to meet time line challenges of special events like trade shows, customer meeting etc. Highly Suitable for Business Enterprise Involved in Catalog Driven Business (e.g. Apparel, Jewelry, Textile, Carpet, Ceramic, Leather, Furniture, Home Furnishing, Crafts, Antiques, Fashion, Lingerie, Toy, Gifts & Novelties, Precious Stones, Stone & Marbles etc) and for Personal Photo Album Making. Most business enterprises who use business catalog for their product presentation, now can depend upon CatalogBuilder for quick, customized and highly objective catalog presentation to fetch higher sales. In addition to its utility for business enterprise, Personal Photo Albums can also be made, managed and published.